Enjoy an innovative game on Diamond Strike 100,000 Scratch at Wicked Jackpots! Designed and created by Pragmatic Play, it is a fun-filled scratch game which offers a maximum payout of £100,000. It consists of classic symbols like Cherries, Golden 7s or Diamonds. Match 3 of them to win. Launch this slot on any device at Wicked Jackpots! 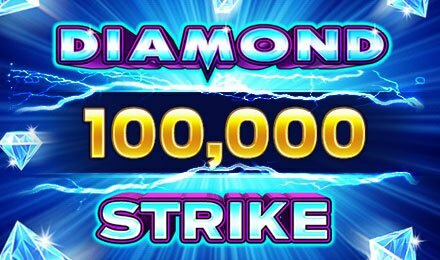 On Diamond Strike 100,000 Scratch, different ticket prices are available for various games. Select one of them and click on the Scratch button or swipe the grid with your cursor to uncover the symbols. Your aim is to match 3 of them to earn a win. The Auto Play option allows you to launch several games played successively. Press the Paytable tab to display the different payouts. Bet Levels: No bet levels are present on this game. Amount of Paylines Selection: No paylines are available as it is a scratch card game. Coin Values: The different ticket costs are £1.00, £5.00, £10.00, £23.75 and £45.00 for 1, 5, 10, 25 and 50 games, respectively. The Golden 7 Free Play symbol on Diamond Strike 100,000 Scratch rewards you with 1 free ticket added to the remaining ones. Opt for 25 games to get a 5% discount applied to the ticket cost. If you choose 50 games, you are offered a discount of 10%. Launch Diamond Strike 100,000 Scratch anytime from the comforts of your home and enjoy a good time!